Juventus scored three second-half goals to comfortably beat Palermo and continue their climb up Serie A.
Mario Mandzukic headed the champions ahead from Paulo Dybala's superb cross before Stefano Sturaro coolly converted a Paul Pogba pass a minute from time. Substitute Simeone Zaza drilled home the third in injury time as the defending champions made it four wins from their last five league games. Juve are six points behind leaders Inter Milan who play Napoli on Monday. Massimiliano Allegri's side are gaining momentum as they look to win the title for a fifth successive year. Juventus have now won seven successive games against Palermo without conceding a goal. And this was another comprehensive victory once former Palermo forward Dybala teed up Mandzukic, who scored the winner as Juventus beat Manchester City 1-0 in the Champions League last Wednesday night, to put the visitors ahead. 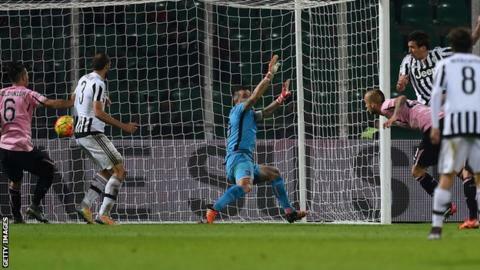 Palermo, who have now won just one of their last six league games, had no response and conceded two goals within the space of four minutes late on as Juve moved up to fifth place. Roma missed the chance to go top of the table as they followed up their 6-1 mid-week Champions League defeat by Barcelona by losing 2-0 at home to Atalanta. Frosinone moved out of the relegation places with a 3-2 win over Verona, while Carpi secured only their second win of the season with a 2-1 success at Genoa. Lazio slumped to a fourth defeat in five games with a 1-0 loss at Empoli, while Udinese beat Chievo 3-2. Match ends, Palermo 0, Juventus 3. Second Half ends, Palermo 0, Juventus 3. Goal! Palermo 0, Juventus 3. Simone Zaza (Juventus) left footed shot from the left side of the box to the bottom left corner. Assisted by Álvaro Morata. Aleksandar Trajkovski (Palermo) wins a free kick in the defensive half. Edoardo Goldaniga (Palermo) wins a free kick in the defensive half. Offside, Juventus. Patrice Evra tries a through ball, but Álvaro Morata is caught offside. Foul by Franco Vázquez (Palermo). Goal! Palermo 0, Juventus 2. Stefano Sturaro (Juventus) left footed shot from the centre of the box to the bottom right corner. Assisted by Paul Pogba. Offside, Juventus. Claudio Marchisio tries a through ball, but Simone Zaza is caught offside. Foul by Giancarlo Gonzalez (Palermo). Álvaro Morata (Juventus) wins a free kick on the right wing. Substitution, Juventus. Simone Zaza replaces Paulo Dybala. Foul by Mato Jajalo (Palermo). Franco Vázquez (Palermo) is shown the yellow card. Substitution, Palermo. Andrea Rispoli replaces Aljaz Struna. Attempt missed. Paul Pogba (Juventus) right footed shot from outside the box misses to the right. Assisted by Álvaro Morata. Attempt missed. Aleksandar Trajkovski (Palermo) right footed shot from the centre of the box misses to the left. Assisted by Aljaz Struna. Attempt missed. Achraf Lazaar (Palermo) left footed shot from outside the box misses to the right. Assisted by Gastón Brugman. Substitution, Juventus. Stephan Lichtsteiner replaces Juan Cuadrado. Substitution, Palermo. Aleksandar Trajkovski replaces Alberto Gilardino. Attempt saved. Juan Cuadrado (Juventus) right footed shot from the right side of the box is saved in the bottom right corner. Assisted by Paul Pogba. Attempt blocked. Gastón Brugman (Palermo) right footed shot from outside the box is blocked. Andrea Barzagli (Juventus) is shown the yellow card for a bad foul.